Zion Market Research has published a new report titled “Smart Grid Market by Technology (Advanced Metering Infrastructure, Distribution Automation, Software & Hardware, Communication Service, Cyber Security, and Transmission Upgrades) and by Service (Consulting, Deployment & Integration, and Support & Maintenance): Global Industry Perspective, Comprehensive Analysis, and Forecast, 2018–2024”. 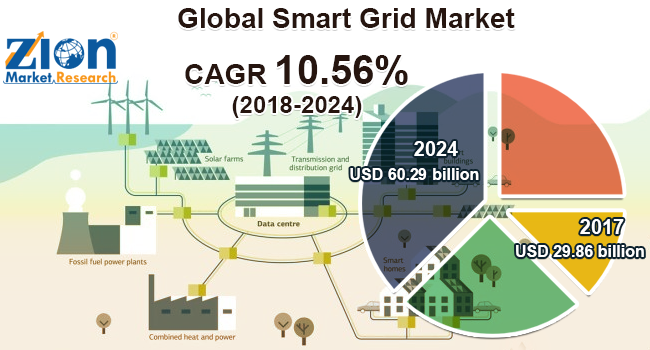 According to the report, the global smart grid market valued at approximately USD 29.86 billion in 2017 and is expected to generate revenue of around USD 60.29 billion by 2024, growing at a CAGR of around 10.56% between 2018 and 2024. The rising need for energy consumption is the primary factor fuelling the smart grid market. The increasing investments made for grid digitalization with the help of smart and advanced technologies by business organizations are likely to boost the smart grid market growth in the upcoming years. Government initiatives to increase the use of renewable forms of energy, the existing generation mix, and escalating demand for creating green, infrastructure facilities are further anticipated to foster the smart grid market expansion in the future. In comparison to the old electric grid systems, smart grid systems are technologically upgraded. The whole smart grid system consists of computers, advanced controls with new technologies, and automation and gears, for enhancing its operational efficiency. Moreover, smart grid systems are implemented to overcome the disadvantages of traditional and conventional electric grids that consume more energy. Furthermore, the growing need to digitalize energy and power sectors and the huge need to develop electric grid infrastructures are likely to positively impact this market. Additionally, to support the growing needs of energy, the smart grid system, and its infrastructure is required. By technology, the smart grid market is segmented into advanced metering infrastructure, distribution automation, software and hardware, communication services, cybersecurity, and transmission upgrades. Communication services are expected to dominate the smart grid market, as communication equipment with customer load control in the smart grid infrastructure helps in monitoring the grid’s functionality and effectiveness. By service, this market includes consulting, deployment and integration, and support and maintenance. The deployment and integration segment is expected to dominate the market, due to the growing R&D investments made by the manufacturing companies toward smart grid pilot’s project. North America is growing significantly in the global smart grid market and is foreseen to continue its dominance over the forecast time period. The growing number of natural disasters including unplanned power outages, storms, rains, and others is going to boost smart grid market growth in the region. Moreover, government initiatives in the U.S. for planned energy consumption are likely to further drive the industry growth in this region in the future. The Asia Pacific is predicted to provide significant growth opportunities for the smart grid market in the years ahead, due to the ongoing smart home, smart building, and smart infrastructure construction activities. Additionally, the enforcement of stringent government laws for reducing carbon emissions and air pollution is likely to drive the Asia Pacific smart grid market over the forecast timeframe. Some industry players operating in the global smart grid market include Siemens, ABB, General Electric, Itron, Schneider Electric, Belden, Honeywell, Hubbell, Landis+Gyr, Oracle, Cisco, Fujitsu General, IBM, and Wipro.